This Waltons shed comes with a simplistic design, but there is certainly nothing simplistic about its features. Built with extreme durability and security in mind, this tongue and groove windowless building is incredibly affordable and offers a safe, secure, dry place to store everything from essential gardening equipment to medium-weight machinery. A 10 year anti-rot warranty provides reassurance, while the apex roof with covered sand felt ensures year round water-resistance. 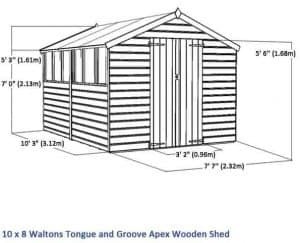 This is a tongue and groove, strong wooden shed made by Waltons and it features a very spacious design. Like most sheds these days, this model has an apex roof to ensure year round protection against rainwater. 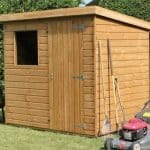 It also gives the shed a much larger height, making it particularly useful for storing high tools and machinery. It also makes the building much better suited to taller individuals. Covered with a heavy duty sand felt, the roof is also protected from falling debris and it adds an extra level of rot-resistance. To give you a better idea of how much height is provided with the shed, its roof measures 2.13m. The eaves are also impressively high at 1.61m. In line with this spacious design, the double doors also measure 1.68m high and a compact 0.96m wide. Finally you have a depth of 3.12m and an overall width of 2.32m. With 12mm Shiplap tongue and groove cladding, you are provided with a strong, rainwater-resistant structure. Shiplap comes with a variety of benefits and is only used on high-end sheds. It has a really thick, slightly overlapping design that helps to give it a lot of stability. Waltons have also constructed the cladding with a tongue and groove design. The stand out feature of this is that it leaves a generous expansion gap. Helping to accommodate any changes that occur throughout the seasons, this gap ensures the overall structure of the building isn’t affected or compromised. Whilst Shiplap and tongue and groove cladding does provide a more stylish effect, it isn’t actually used for this purpose. The reason why tongue and groove cladding is so popular for example, is because it offers a very high level of weather and water protection. Sheds created with this style of cladding have an interlocking design which also helps to create an incredibly robust structure. The tongue feature is located at one edge of the panels, while the groove is located at the other. They then simply click together to form a strong locking bond, making assembly pretty straight forward. We like that the building comes with double edged framing. 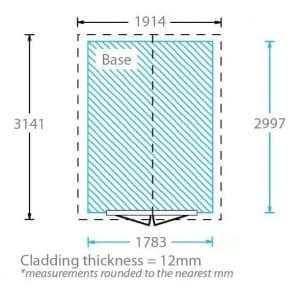 At 28mm x 28mm, it is a standard thickness featured in many outdoor buildings. However, the double edged feature does provide a lot more stability over a lot of other models. The one thing we do advise you take into consideration is the fact that the tongue and groove cladding isn’t carried through to the roof and floor. Instead you are provided with solid sheet materials. The floor materials measure 10mm thick. Again this is pretty standard for Walton’s wooden sheds, but what you’ll find is it isn’t overly strong. 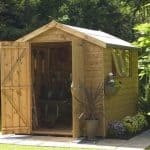 So if you are thinking about turning this shed into a workshop or hobby shed, it’s definitely worth buying a support kit to ensure it can handle the weight of heavier equipment or machinery. The treatment requirements for Shiplap clad sheds aren’t as strict as overlap. This is because you are advised to use a spirit based treatment which offers a much better barrier against water. Spirit treatments work deep into the timber, penetrating through and forming an internal barrier as well as an external one. So what you’ll find is that they don’t need to be reapplied every year. Of course this will depend upon the brand you choose, as not all spirit treatments are made equal. However, providing you invest in a good quality treatment, you won’t have to worry about yearly application. 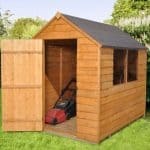 There is the option to use a water based treatment but we don’t advise that due to the warranty conditions you have to meet and the fact you will need to keep treating the shed on a yearly basis. 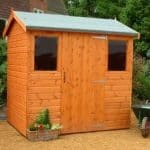 One of the advantages of this shed is that Walton’s provide a 10 year anti-rot warranty. However, this guarantee only covers you if you use a spirit based treatment. There’s also a requirement that you have to treat the building once you’ve finished assembling it. If you don’t follow these instructions, you will not be covered by the guarantee and there is a chance the shed could rot if you don’t maintain the annual treatments. The double doors do provide plenty of room to transfer items in and out of the building, but they aren’t the widest we’ve seen on similar sized buildings. What we do like about them is their ledge design. This typically gives the doors better stability and it also enables you to easily install a hasp and staple if you’re looking to add extra security. A butterfly catch is included which makes sure the doors stay closed in strong winds. This doesn’t keep them locked, but it does give you peace of mind in harsh weather conditions. Like others in the same range, this shed doesn’t have windows. The reason behind this is privacy. However, what it means is that you won’t benefit from any natural lighting. Due to the size of the building, this can produce issues when trying to find items at the back of the shed. It can also be problematic on cloudy days or at night. So we do recommend installing an electrical pack; especially if you are going to be using it as a workshop. 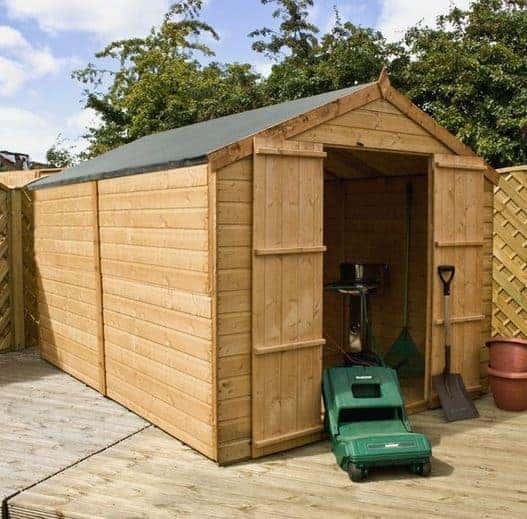 The shed is advertised as being built for both durability and security. However, we don’t feel Walton’s have made this building as secure as it could be. The thick cladding does provide good anti-thief protection as it definitely isn’t easy to break through. Then there’s the privacy and security provided by the windowless design. The only trouble is, it doesn’t come with a lock. This to us is a very basic security feature. The butterfly catch will only stop the doors from opening when they shouldn’t. For example, they won’t blow open in windy conditions as we mentioned earlier. The catch doesn’t actually lock the shed. So while it may be effective at keeping small children out of the building, it won’t do much in terms of keeping thieves out. This isn’t a problem at all provided your garden is very secure and people aren’t able to just walk in. However, if there is a possibility of somebody getting into the garden, it is highly recommended you invest in a good, solid locking system. This means spending more money which isn’t a huge concern due to the low cost of the actual building. However, it’s still something worth taking into account. You can’t really customise the shed much, but the positive side of that is you won’t need to spend a lot of extra money. One customisation option some people find useful is the superior duty roof felt. Made from fiberglass, it offers more protection than the heavy duty felt recommended, therefore extending its life. However, we don’t feel this is a necessary upgrade; it’s more there for better peace of mind. You’re never short of extras when buying a Waltons shed. This one comes with quite a lot of additional options, with some being a lot more necessary than others. Take the extra strength support pack for example. When you buy this shed, you are given a free floor support kit. It comes with 12 floor joists measuring 2350mm in length. Providing you aren’t storing anything really heavy, this support kit is actually sufficient enough and will lengthen the life of the building. However, if you truly want maximum peace of mind and the ability to store anything you may need to, the extra strength floor support kit is recommended. It is also essential if you plan on storing heavy boxes or lawnmowers. Another extra we think should be considered an essential is the Portabase. 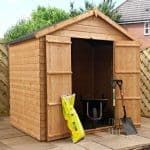 What you’ll find with most sheds is that they need to be assembled on top of a reliable, solid and even surface. It’s often difficult to assure this; especially if you are building it on top of a lawn or paving slabs. The Waltons 10×8 Portabase may be a little on the pricey side, but it really helps to add stability to the shed, as well as giving it further protection against rot. The only other extra we consider a ‘must-buy’, is the weatherproof padlock. As mentioned earlier, it is a slight concern that this shed doesn’t come with a lock. This 49mm weatherproof padlock is also supplied with a hasp and staple which gives the building a much more secure design. The other extras available aren’t as essential, such as the draper accessories and treatments. Along with the free floor support kit, Waltons also give you a free Golden Brown 5L treatment. So unless you want a different colour, you won’t have to buy additional treatments for at least a year. There are parts of this shed that could be improved, but the quality definitely isn’t one of them. Waltons never disappoint us in terms of quality. The 7.8/10 rating might not seem that great, but it’s actually pretty impressive. It is the tongue and groove structure that gives the building a great overall durability. However, the fact it needs regularly treating does lower its rating a little. Even though this is a large building to start with, it still provides a great level of space compared to some of its competitors. The potential to hang shelving is a benefit and gives you the chance to increase its overall storage capacity. The shed is easy to put together, but you shouldn’t underestimate how long it will take you to construct it. After all, this is a big building and the panels are therefore going to be heavy. While the recommended number of people to assemble the shed is 2, we recommend that at least 3 people put it together. All things considered this shed provides an exceptional value for money. There are only two niggles we have which have slightly lowered its rating. These include the fact you have to spend money on regular treatments and also that you need to invest in a better lock. Final Thoughts: If you’re searching for a high quality, large storage shed that offers excellent longevity and a range of great features, this is a good model to consider. Like most sheds, it does come with a few downsides, but in our view the pros definitely outweigh the cons. If you’re not overly keen on the look of the shed, you do have the option to paint it. Overall though we feel this is a fantastic, simplistic storage space with a very high quality design.